The 2018 Japanese Super Formula Championship, the sixth season of the Japanese premier open-wheel competition under the Super Formula name, will start this weekend at Suzuka Circuit. The championship featured seven racing weekends in six venues, the same as the year before. The grid again consists of nineteen cars from eleven teams, with twenty-one drivers announced as competitors, sixteen of them from Japan and five foreigners. All drivers will use a Dallara SF14 chassis for the last time as a new SF19 chassis is announced for the next season. Engine suppliers are the same – Toyota (11 cars) and Honda (8 cars). The 2017 champion Hiroaki Ishiura will try to defend his title in the #1 Toyota against six rookies and fourteen drivers who already have experience in Super Formula. There are many changes on the grid. Andre Lotterer left the championship after fifteen seasons in Formula Nippon and Super Formula, in which he was ten times in the top 3 drivers, including championship title in 2011. Takashi Kogure, who made Formula Nippon debut in 2003, also left the series. Last year’s front-runners Pierre Gasly and Felix Rosenqvist also won’t be on the grid in 2018. Gasly graduated to Formula One while Rosenqvist focuses on Formula E. One more European youngster Jann Mardenborough left Super Formula to focus on Super GT Series only. Who are replacements? James Rossiter is returning to Super Formula after one season out of the championship, joining Kazuki Nakajima in Vantelin Team Tom’s instead of Lotterer. Ryo Hirakawa is also returnee after two seasons out, replacing Mardenborough in the Team Impul’s #20 Toyota. Among rookies, the biggest name is definitely Pietro Fittipaldi. A grandson of the former F1 champion won the World Series Formula V8 3.5 last year and would combine IndyCar Series and Super Formula this year. Due to clashing commitments, he will be replaced in the #7 Toyota at Autopolis and Sugo by another rookie Tom Dillmann. The 31-year-old Katsumasa Chiyo has an impressive record in GT racing but he will be rookie on the Super Formula grid in 2018, in the #50 B-Max Racing’s Honda. Docomo Team Dandelion Racing signed Nobuharu Matsushita to drive their #6 Honda. 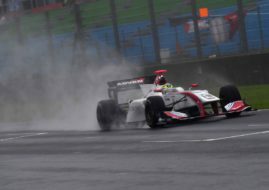 Matsushita spent last three seasons in GP2 Series and Formula 2 Championship. On the other side, Team Mugen signed current Formula 2 driver Nirei Fukuzumi. As a reserve driver for Fukuzumi’s #15 Honda the team announced Sena Sakaguchi, a young F3 racer from Honda’s driver development programme. Along with a lot of new drivers, there are several Super Formula champions on the grid. P.mu/cerumo Inging team will have two of them – defending champion Hiroaki Ishiura in the #1 Toyota and 2016 champion Yuji Kunimoto in the #2 car. Team Mugen retains the 2013 champion Naoki Yamamoto. A two-time champion Kazuki Nakajima will drive again for Team Tom’s, parallel to his FIA WEC commitments with Toyota.